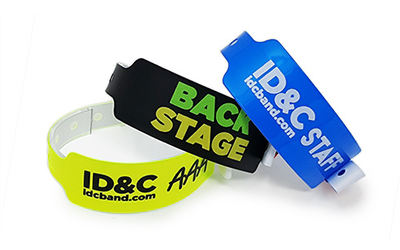 ID&C offers the UK's largest range of custom event wristbands. With over 20 years experience in the promotional and live event industries, we pride ourselves on offering the highest quality printed wristbands with fast turn around times. All our wrist bands can be enhanced with custom print or bought from plain stock. 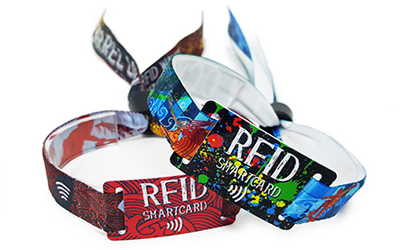 From RFID, the ultimate in high security wristband technology, to barcodes, patented locks and simple custom Tyvek wristbands. We offer printed Paper Tyvek Wristbands, Plastic Vinyl Wristbands, Printed Silicone Wristbands, Cloth Wristbands and RFID enabled Wristbands. 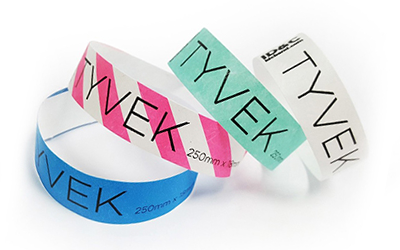 Tyvek or paper wristbands, offer a cheap and simple solution for admission control at events, nightclubs and parties. The tamper-proof design ensures they are non-transferrable and can be customised with black print, or full-color Chroma for a more premium look. We also have the very popular pre-printed tyvek and chroma options for schools, Kindergarten, events and holidays. Vinyl wristbands, also known as plastic wristbands, are recommended for multi-day events as they are more comfortable and more durable than Tyvek wristbands. 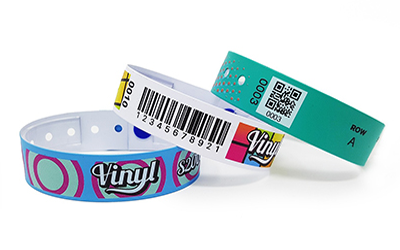 Our vinyl wristbands use a self-locking clip, that when closed, cannot be undone. Our Fabric wristbands are available in woven or satin cloth materials and when customized, are highly secure. Woven wristbands are most commonly used at music festivals, but have become a popular wristband choice for any kind of event. A really popular wristband for weddings is the Adjustable Bead variety as they are great keep-sakes. Often referred to as rubber wristbands, our silicone wristbands are indeed made from a silicon material which is soft, durable, waterproof and comfortable to wear.The standard silicone wristband is often used to promote charity campaigns or awareness schemes. However when combined with RFID technology, they are also perfect for hotels, waterparks and other leisure resorts. 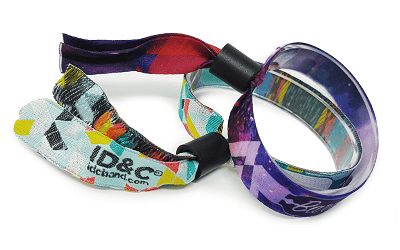 At ID&C we've supplied more than 8 million RFID wristband to festivals and events around the world. With our patented Smartlock they become the world's most secure wristbands for events. Our RFID technology can be utilised with many different variations of our wristbands to cater to all different types of events and venues. 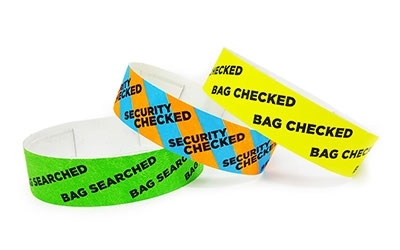 For security, our Tyvek, Vinyl or Fabric wristbands are the best option for your event. Each of these wristbands comes with a type of secure, single use tamper proof clasp (or wristband lock). You can even design your own wristbands and buy them online. Silicone wristbands are most suitable for promotional purposes. They can be printed with a charity message, logo or slogan and come in any color as well as different shapes. Choose from embossed, debossed, printed and ink filled silicone wristbands.